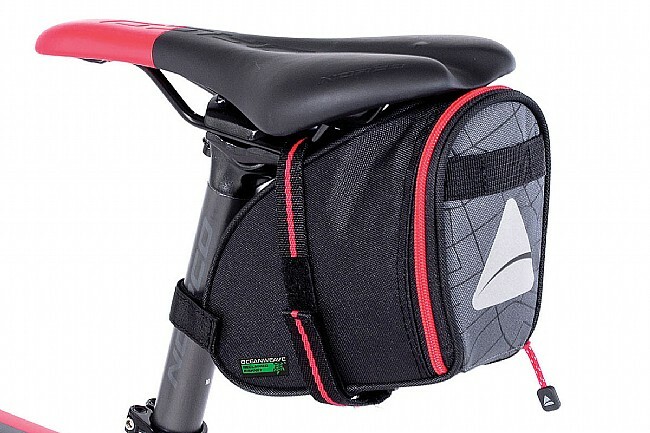 The Axiom Seymour Oceanweave Wedge is a lightweight, durable 1.3 L saddle bag designed to carry ride essentials. Constructed using Axiom's Oceanweave 600D recycled fishnet polyester, the Seymour is not only helping to store away riding essentials, it helps to clean up the environment. Featuring the same durability and performance that fishnets have when they're new, the Oceanweave fabric doesn't force a decision between high-quality, durable fabrics and being eco-conscious. The Seymour bag is finished with a polyurethane waterproof coating, helping to keep the elements out so your cards, cash, or other riding essentials stay safely dry all ride long. Also available in a 0.5L version. Good design & fits narrow saddles. Riding paved and packed gravel trials with the grand kids and needed a user friendly seat bag. On the rebound from trying seat bags from the big O, T, T2, B and LG. If you are not afraid of Velcro straps and or zippers to access your stuff this is the bag to try. Narrow and tall means it fits under a 140mm wide saddle and clears your legs too. Construction is good for this price range and zipper works fine so far. Will see how it holds up since Axiom appears to be the new kid on the block. Really appreciate the lack of internal stiffeners which means irregular shapes of, spare tube, multi tool, patch kit, phone, etc. fit without doing a tetras exercise. Will see if the waterproof coating is for real soon enough. Recommended. With easy installation and access to contents as standard.